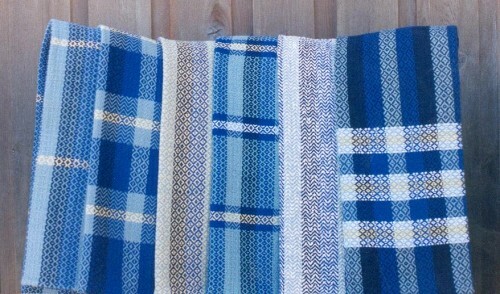 100% Cotton tea towels or table runners. Practical but beautiful useable art. Order the colours you like. Many patterns possible. Mercerized cotton can be used for runners and imparts a shine to the finished product. 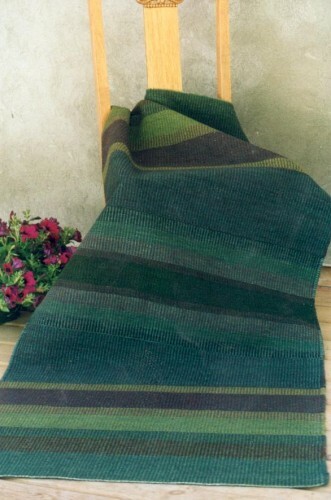 Rugs made from wool on either a cotton rug yarn or linen rug yarn. Washed & blocked ready to use. 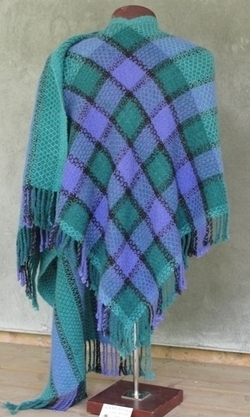 This is an L-shaped shawl,which sits on the wearer's shoulders much better than a straight shawl. Fronts can be be short or long. This one is made from Mohair, wool and silk. It can be worn several different ways, belted, pinned with a shawl pin or one end thrown over the shoulder. 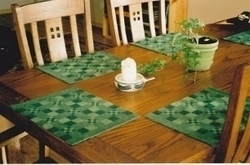 Placemats- order the number you need from 2 to 16, in the size you want from luncheon plate size to large dinner plate size. Choose the colours you want. Cost according to fibre, size, weave structure and number ordered. Afghans, throws, shawls. Made from whatever fibre you desire. 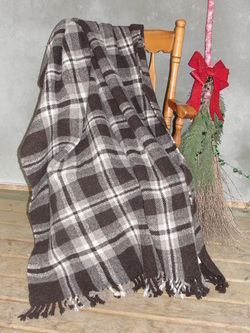 This blanket is 100% wool in natural colours- brown, gray and white. Size is 77" wide x96" long. Pre-washed and finished, already sold. Phone for a studio viewing, shopping or lessons. Some weaving for sale. Commissions taken with some input from purchaser regarding colours,size,type of yarns.